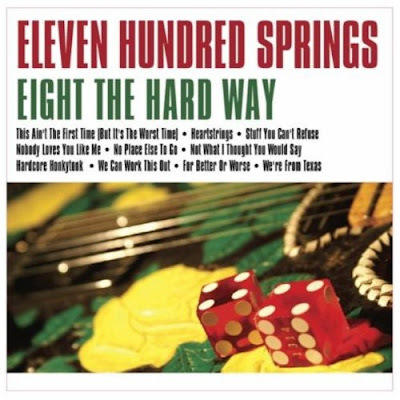 Review: Eleven Hundred Springs "Eight The Hard Way"
The music business is tough, and any artist or group that manages to write, record, market and tour with eight albums has to be taken seriously. With "Eight The Hard Way," the Texas country supergroup Eleven Hundred Sprngs acknowledges this musical milestone with all the heart and soul that makes number eight - well, great. "This Ain't The First Time" starts the album off on a winning note with a strong melody and interesting lyrics. However, it is the upbeat love song "Heartstrings" that really gets the band's eighth album off to a powerful start. The most surprising track on the album is the slightly mysterious cut "Stuff You Can't Refuse," but the best song on the set is the passionate "Nobody Loves You Like Me," which deserves careful attention from radio program directors in multiple genres.